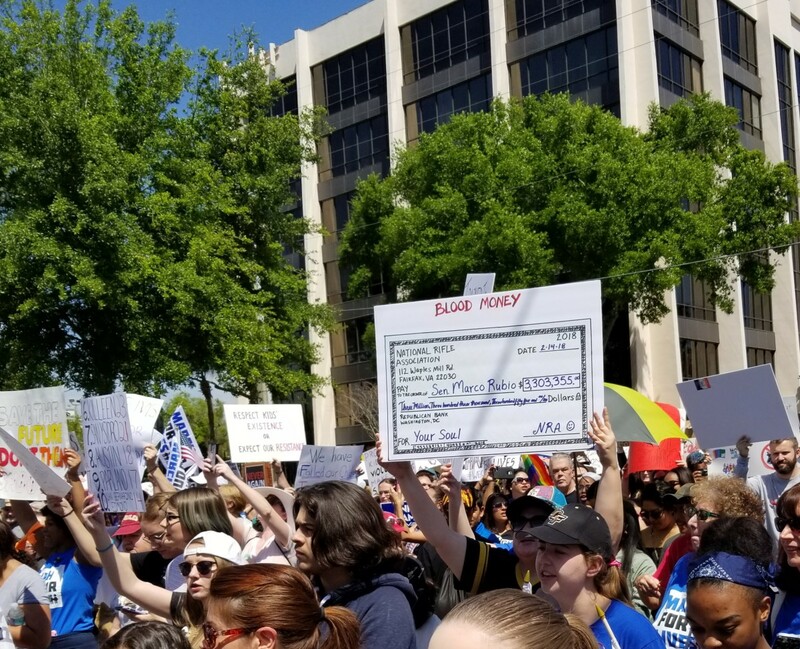 On March 24, 2018, millions of people across the United States, and even around the world, marched to demand gun safety legislation to protect the lives of children in schools. 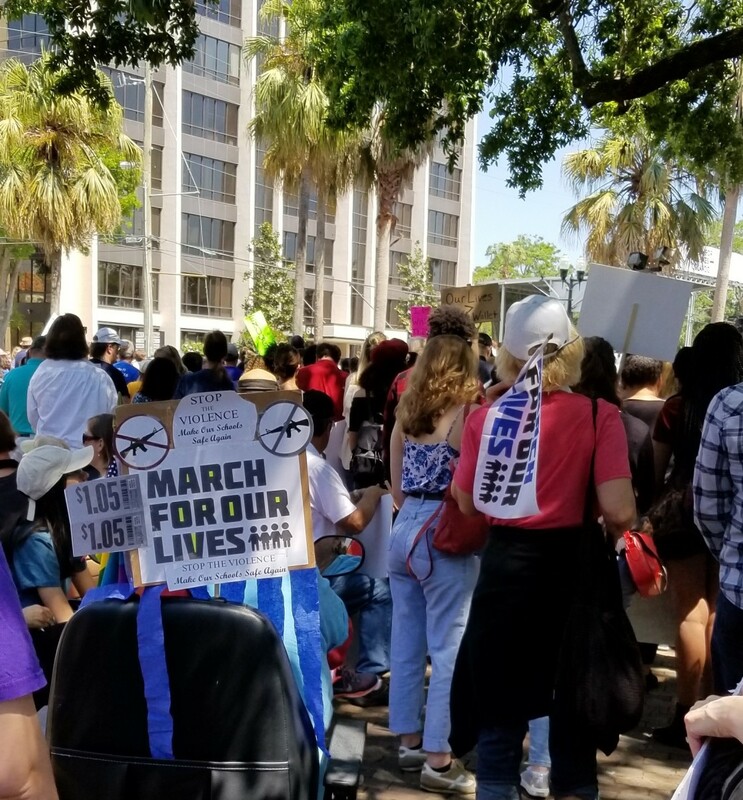 Over 800 marches took place on this Saturday to show that the world had had enough deaths from assault rifles used by angry young men. I traveled in a bus filled with 56 men and women from our retirement community south of Kissimmee. Each of us felt a burning need to make our feelings known about the horrors of rampant, uncontrolled guns in the United States. Just a few weeks ago and a few counties away, 17 Marjory Stoneman Douglas students died in their school when yet another mass shooting took place. We cannot continue on in this way. 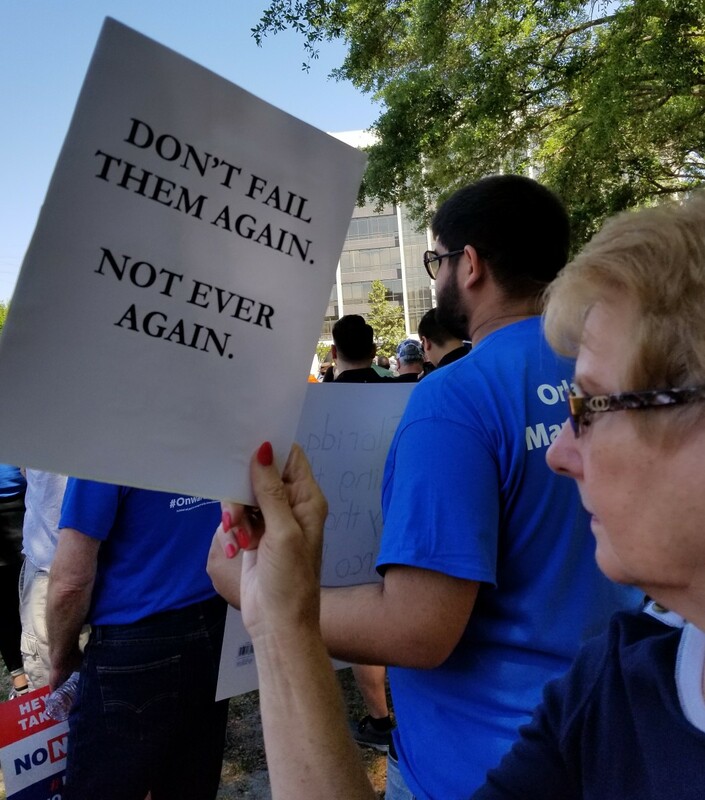 Below, I document the march with photos of the day that we stood up and said, "things cannot go on this way any longer." 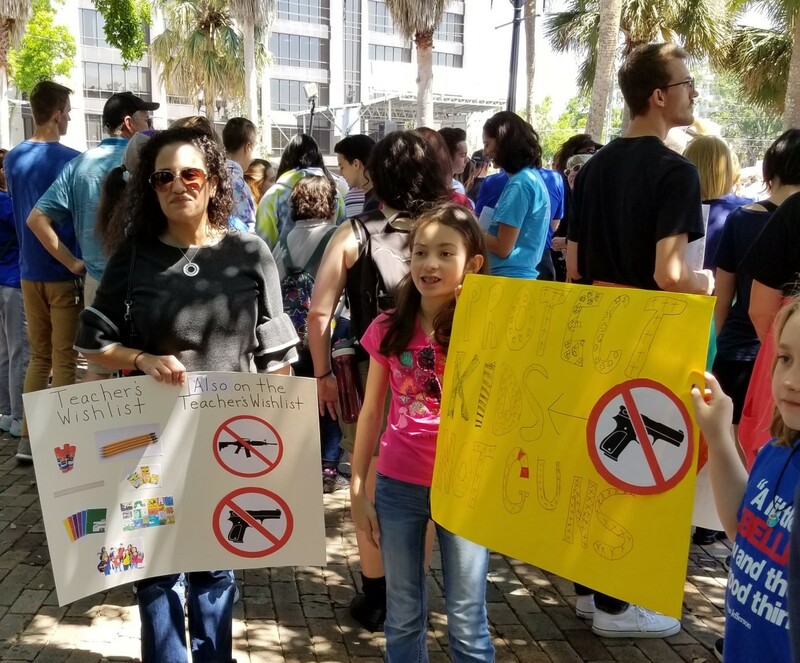 On a sunny, 80 degree day in March 2018, people came from all around Central Florida to participate, to make a statement about gun safety laws. They left their daily activities and took time from their busy lives to make their feelings known. No more thoughts and prayers, it was time for action. It was time for legislators to listen to the people and make changes in the nation's gun laws. It was time to cut the ties to the NRA (National Rifle Association) and to listen to the people. 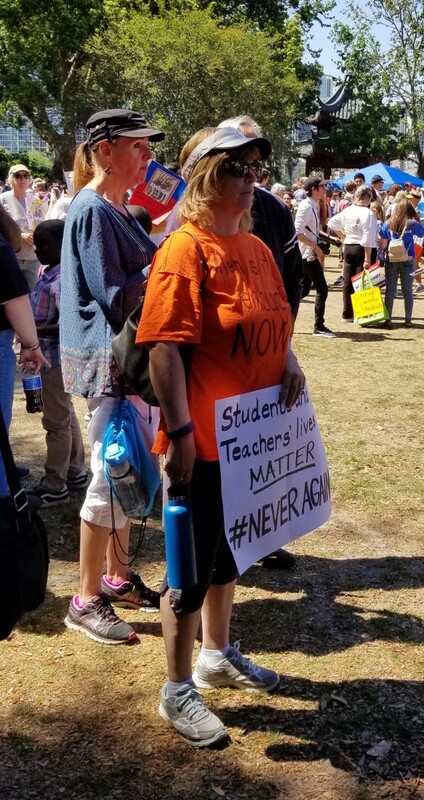 There were teachers with signs. On said, "Students and teachers lives matter. Never Again." 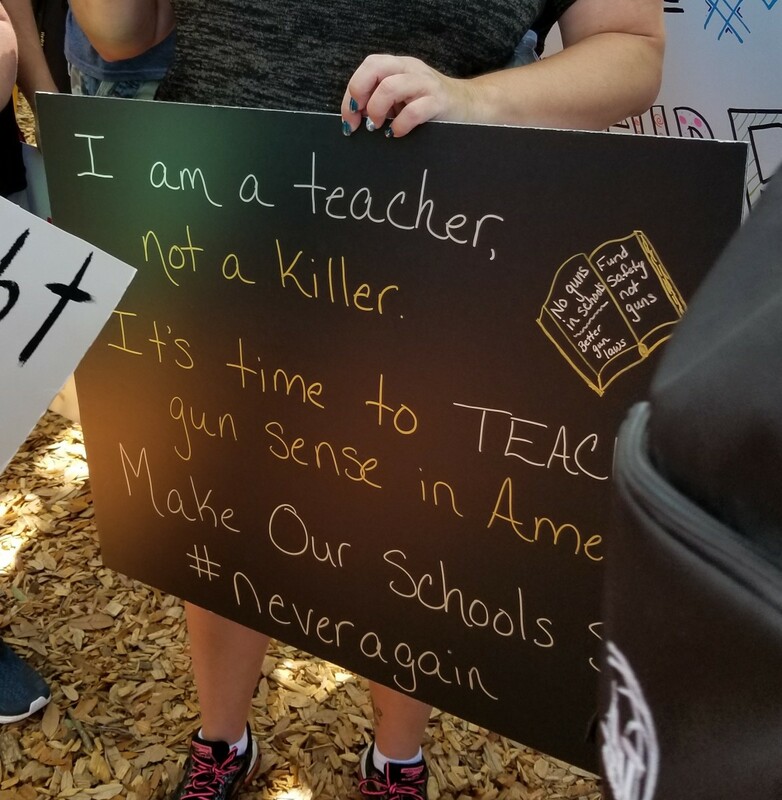 Another said, "I am a teacher, not a killer. It's time to teach gun sense in America. Make our schools safe." 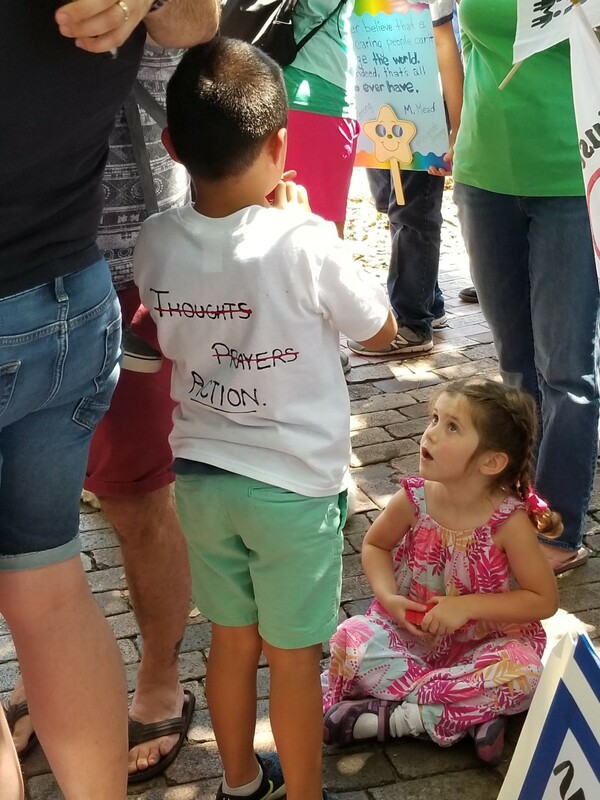 There were children with t-shirts protesting the lack of safety in their schools. There were retirees who had marched in the sixties for Civil Rights and against the Vietnam War. Now, they carried signs saying "I'm marching for my grandchild to go to school without fear of being killed." Did You Attend One of the Marches? Yes, I was at one. I couldn't go, but I support the cause. I watched it on the news. I'm not in favor of changing the gun laws and would not go to one of these marches. Senator Rubio and the NRA Were Under Attack! 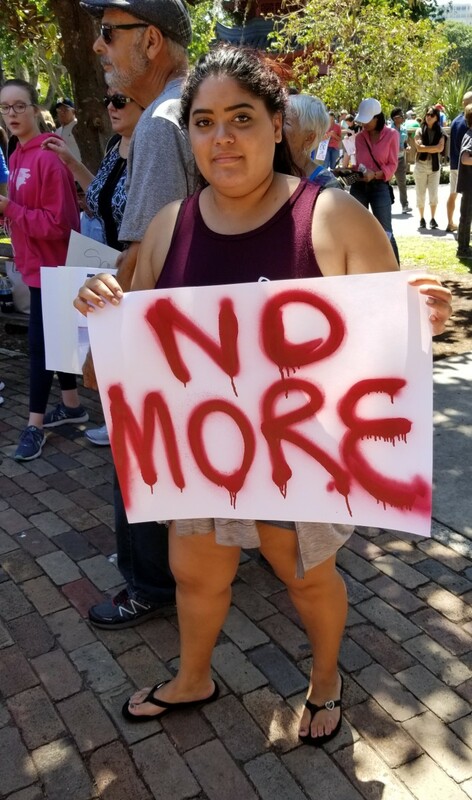 The people seeking safety in schools and other public places were angry at the NRA for their role in the gun proliferation and the many deaths from guns in the U.S. There was also awareness of people in Congress who took campaign donations from the NRA and then blocked legislation that would control assault rifles. 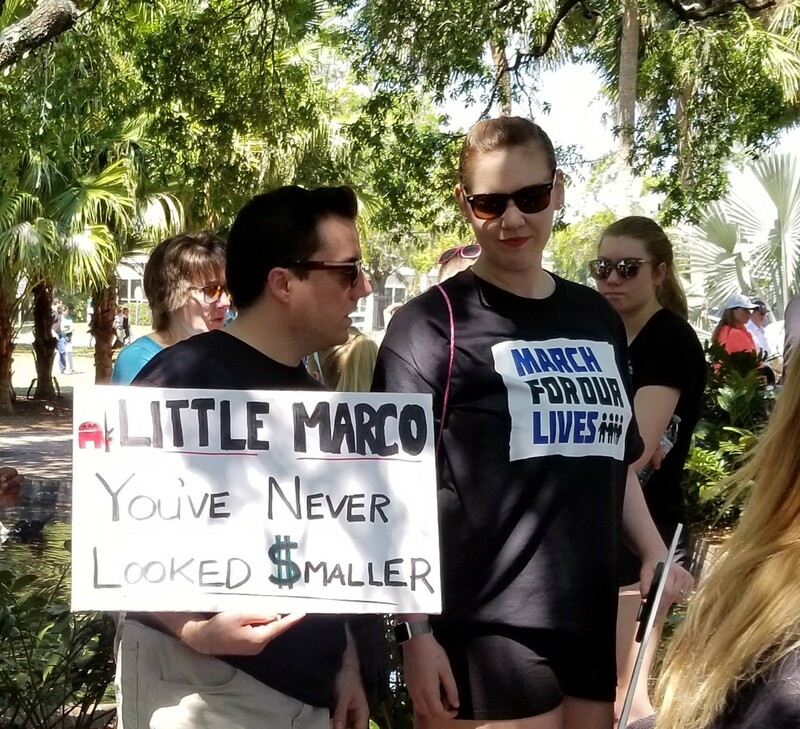 Florida's Senator Rubio is one of the ones receiving a great amount of money from the NRA. 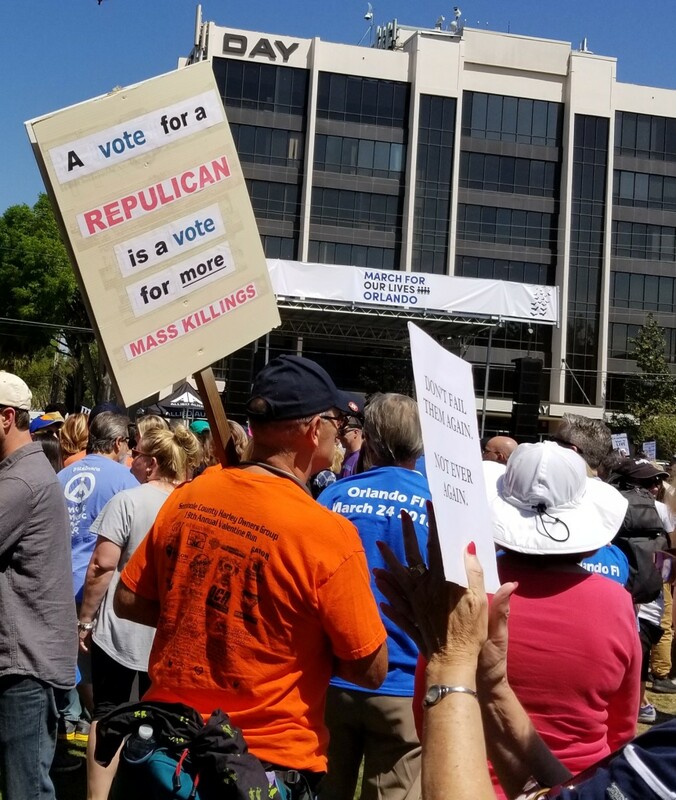 Besides listening to inspirational speeches about the issue of controlling assault weapons and making our schools safer, people took the opportunity to be politically active. 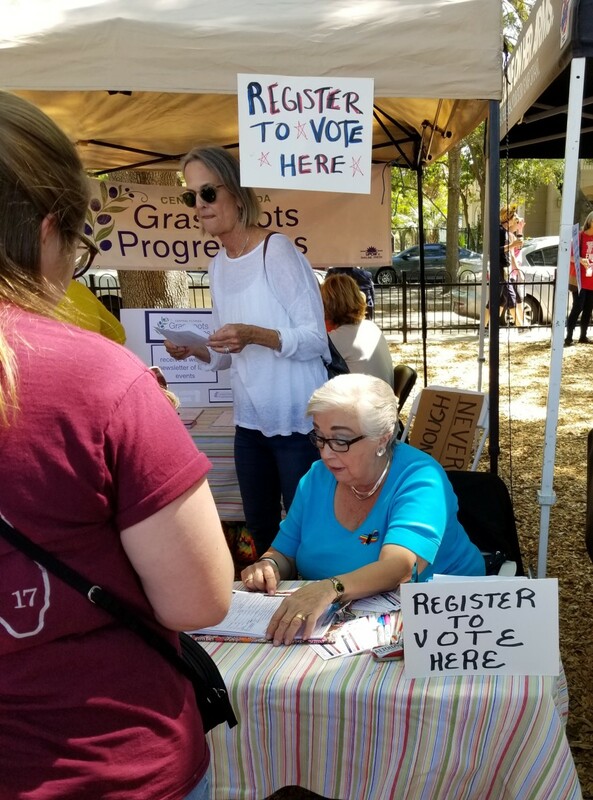 There were booths for registering to vote. 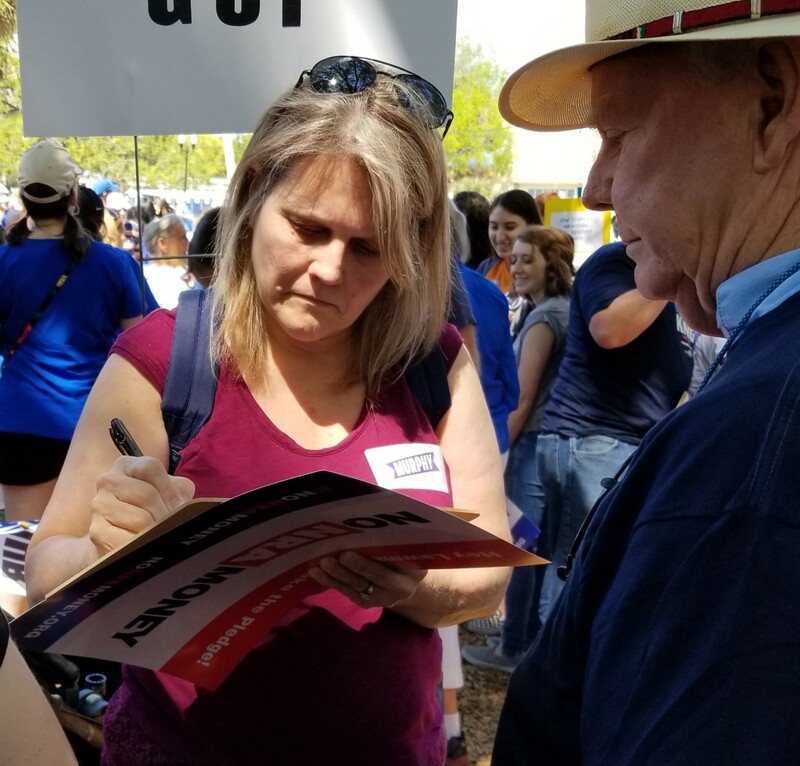 Many candidates for upcoming elections had tents and showed their support for gun control. Petitions were passed around collecting signatures to get initiatives on the ballot. 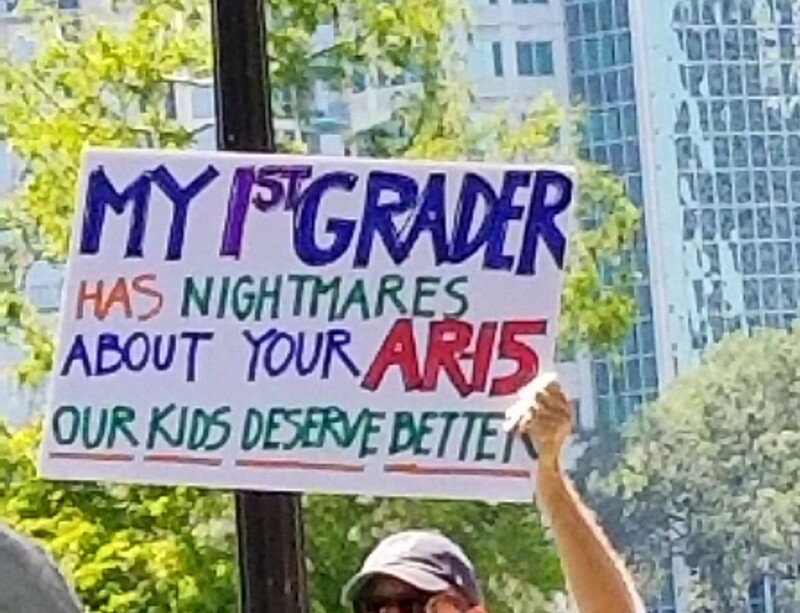 Here are some ideas for signs to make for your next march to protest lax gun laws. This isn't Right or Left. It is Life or Death. There should be a background check before the NRA is allowed to buy a Senator. Actually, guns do kill people. 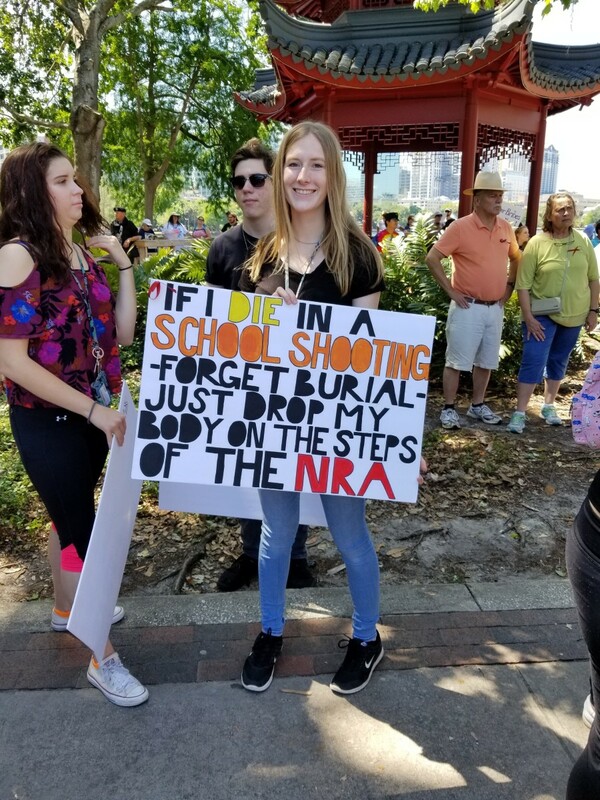 IMAGINE a future free from gun violence. 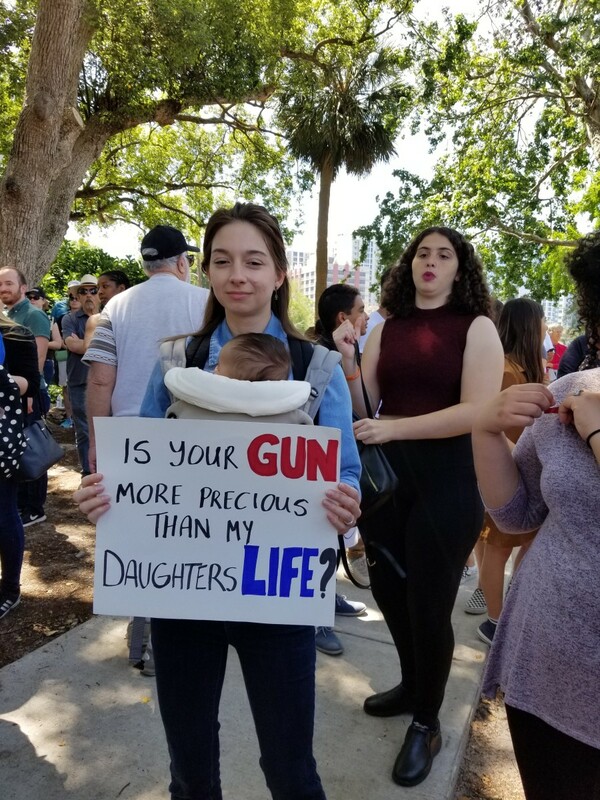 What Is Your Reaction to the March for Our Lives? 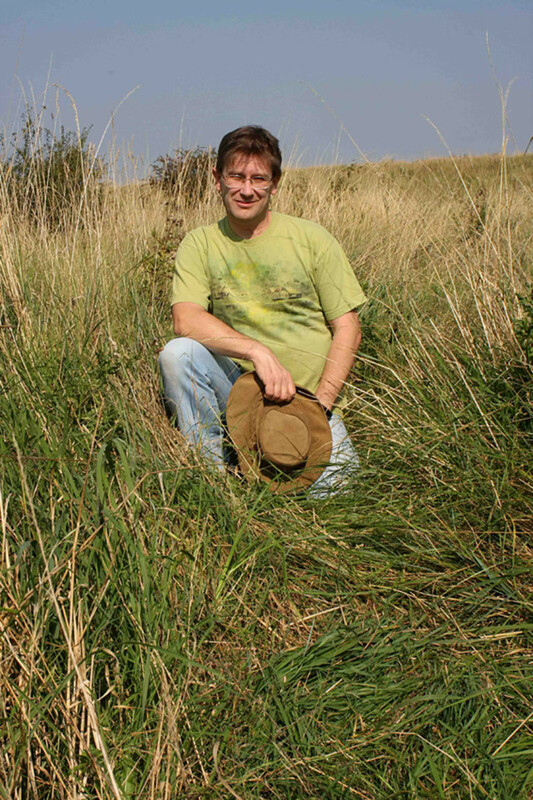 Thank you, bradmasterOCcal, for all your visits that boost my page. As for your comments, it's obvious your mind is made up and I won't waste time trying to change it. You need to listen to what president Trump said about arming teachers. He was very specific, and when you make statements check the source. No one can end gun violence. Just like no one can end alcoholism, or drug abuse. That would be a false statement. How do you think gun violence could be ended? It may not have any place in schools, but depending on the school there is always Fear. This is definitely Left. And marching isn't a solution. You need to march to a solution for there to be a solution. Words on a poster are not a solution. Another liberal pie in the sky. As I said in my previous comment. 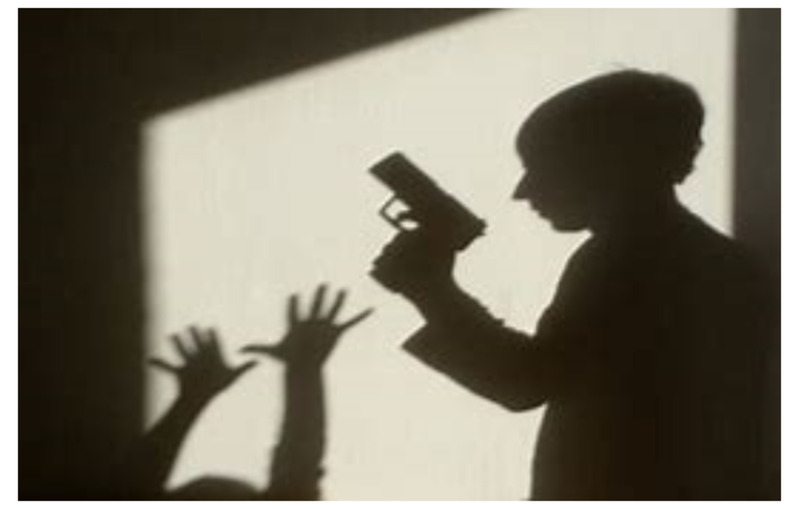 Protecting kids has little to do with law abiding gun owners which is 99.99999% law abiding. But what about protecting kids from drug abuse, or alcoholism. These are killers in their own right. If that was true then the voters are the killers, that voted for them. But, the simple fact is guns without people don't kill. And only people that have some serious problems Kill, with or without a gun. bradmasterOCcal - The bigger issue is not the failures of the officers at the scene of the Parkland shooting or the failure of agencies to follow up on reports of instability of Cruz. The BIG issue is the availability of guns. Without guns, then these other issues would never have been a problem. We can't count on citizens to report unbalanced people. We can't count on mental health care for those people even if they do get reported. We can't count on police officers to be at the right place, to be brave enough and well-trained enough to prevent deaths. The 17 people at Parkland were killed in just 6 minutes. With all due respect that is the supreme issue. And in Parkland those six minutes had 4 deputies standing outside the school. And in a similar case that happened in Maryland that happened after Parkland, an armed resource officer at the school confronted an armed shooter that had killed his ex girlfriend and shot another. But before he could kill anymore the officer took him down. Do you think that shooting took any more time, and that maybe the difference was an officer that was assigned to school actually did his job. While in Parkland they didn't do their jobs and their is no telling how many could have been saved because the shooting was ongoing while the officer stayed outside. The Parkland was a confluence of the sheriff doing nothing after repeated complaints and information was given to them about Cruz, this even included his mother, And the FBI that had credible information that they never followed up, Never even visited Cruz, and after the shooting, they said, we don't know if it were the same person. They would have known, if they had interviewed him. And when looking at the Muslim Terrorists in our country, much of the information was there but not used by the FBI. And that was also the reason that 911 was successful by 19 terrorists. Your arguments are not compelling, and they show that you have no understanding of the issue. The fact is that we have to rely on information, and that is why the NSA and other law enforcement spy on Americans, and capture everything that goes on our phone calls, and on the Internet. If we can't rely on them then why are we letting them violate the 4th amendment. The Austin bomber should give you a preview of what life without gun violence would be in the future. Do you think that this bomber was a genius and only he was able to make working bombs that he could detonate. And if you are concerned about the lives of school children, then why isn't a major issue preventing deaths from drugs? More students are dying or injured from drugs than from guns. Look it up, or read my article. 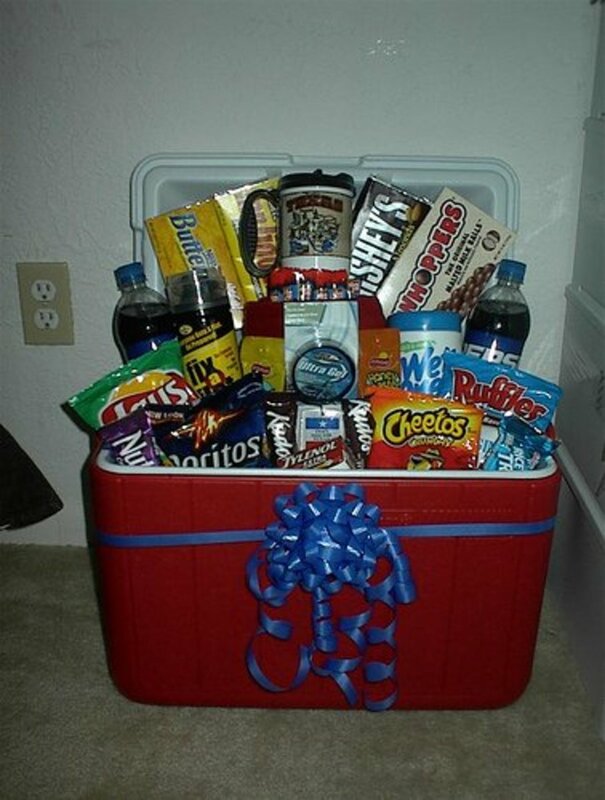 In addition, what about all the people dying from the results of misusing Alcohol. Why isn't that an issues for saving lives of school children? Removing the easy accessibility of the kinds of gun used in the mass shootings is the way to go. How many deaths have been caused by guns in the schools? And how many deaths will be saved in the future from removing easy access, whatever that means. There are over 300 million legal guns in the US in existence today. How is your solution going to change that. We already have gun control laws, and in 2009-2011 the democrats had a super majority meaning they could have created and passed any law they wanted to. But, apparently gun control laws weren't on their todo list. We already have laws making drugs and drug use illegal but that doesn't stop the thousands of deaths from drugs. Nor does it stop the mental health problems from drug addiction. We have laws about misusing alcohol and DUI, And we have had MADD make a homicide out of DUI death. Homicides require Mens Rea or Criminal Intent, but MADD got congress to change it to a strict liability. In neither of these deaths do we take away the vehicles, or do we outlaw Alcohol. Alcohol even had an amendment to prohibit it. But, we all know how not successful that was. So why are guns different than deaths by Alcohol or Drugs? And we don't punish 99.99999% of law abiding users of guns, alcohol or drugs, nor should we. Great update. It appears that the March for Life may be in the top 5 for attendance. Why is it not important that in Parkland, it was the failure of the Brower Sheriff and the FBI which had the information on Nikolas Cruz to stop him or at least watch him. He was a credible threat, and neither the Sheriff or the FBI even followed up on him. In addition, when Parkland school had a full fledged sheriff deputy at the school, but he did nothing along with three other officers at the scene. How many lives could have been saved if that sheriff and his other three deputies would have confronted the shooter. Why is that not part of the march? What happened to protect and serve, and Brower sheriffs did nether! Did the Federal Bureau of INVESTIGATION actually Investigate Cruz, the answer is no. We didn't need armed teachers, we had a real life sheriff deputy assigned and on school premises, but he never went inside the school when the shooting was going on. Isn't that the bigger issue, along with the FBI failure to followup on Cruz! I'm so happy you shared your experience here. It's admirable how much support this is getting and I hope the elected representatives listen to the people.